One of my favorite things about a new year is a new set of reading goals. Some of these will look familiar as they're basically goals I've made in previous years and others are brand new and probably will be here for 2016 only. Here's what I will be working on. I'm kicking off the list with a familiar goal. In 2014, I looked at my 2009 to-read list. Last year, I gave attention to 2010. So of course now it's 2011's turn. There are some good ones that have been hanging out there for the last five years: Tuesdays at the Castle by Jessica Day George (which I might read to my kids), Mitten Strings for God by Katrina Kenison (which I think would be a perfect one to read around Mother's Day), or How Green was My Valley by Richard Llewellyn (which feels like a book I should have already read ages ago), to name a few. There are so many authors I've had on my radar for years but haven't gotten around to trying yet. This is the year to make it a priority. I'm not putting any restrictions on genre or publishing year. They can be classic or current, high-brow or chick-lit. Some choices include Eva Ibbotson, Susanna Kearsley, and Edith Wharton. I like to be fair. Okay, not really. But I have a handful of male authors I've been meaning to read for a long time, too, so I might as well have a reason to read at least one of them too. Same rules apply as to the goal above. I have my eye on Wallace Stegner, P.G. Wodehouse, or Ivan Doig. This is the big one. Over the last few years, I've learned that I definitely prefer listening to classics instead of reading them. It's easier for me to get immersed in the story and not get bogged down by the dense writing. But now that I know that, it's time to push myself out of my comfort zone. I specifically chose Jane Austen or Charles Dickens because they're authors I'm already familiar with and I've been wanting read something else by them anyway. I'm a very slow reader, especially with classics, so this goal alone might take me six months to complete. I'm not joking. When I say "with," I mean "separately but together." Last year we read Sideways Stories From Wayside School and Wayside School is Falling Down together, and it was so much fun. I like reading the same books as him because it gives me a reason to become more familiar with the literature for his age group and, more importantly, I love being able to discuss what's going on in the story with him. Mike is taking up this goal as well (although not as formally), and between the two of us, we should be able to enjoy a lot of great books with Aaron. This is the wild card on the list. I have absolutely no idea what I want to read for this goal, and having really open-ended goals has not worked out for me in the past. But the Olympics are happening this year, and I love the Olympics, so I want something to help get me in the mood. Suggestions and recommendations are welcome. I enjoyed reading Little Men so much last year that I knew I needed to give Louisa May Alcott her own goal this year. I thought of making it a "finish a series" type of goal like I've had in the past, but I wanted to be able to branch out to Eight Cousins or something else of hers if I wanted to. 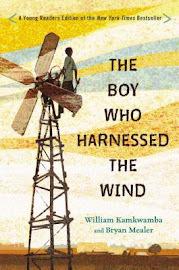 Last year I focused on past Newbery winners. That was really rewarding, and it made me read some books I'd been meaning to for a long time. But . . . it meant that I didn't give nearly as much focus as usual to trending books. 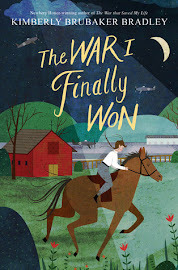 Consequently, the Newbery is being announced on Monday, and I don't have a single book to root for. I'm pretty sad about that actually. This year, I'm trying to figure out how to strike a balance between past and present, and so I'm going vague. "Newbery-related" can be interpreted as a past winner (of the medal or an honor) or a book that has the potential to win the Newbery in 2017. I wish that I was a faster reader and could bump up that number to ten or even twenty, but I know that even five will feel like a challenge with everything else I want to read. I'll be honest, it's kind of nice to have one goal that I can easily knock off in a day or two if I'm feeling behind. Plus, the more poetry I read, the more I love it. I could have just said, "Reread two books," but I'm being super specific here because these were both books I was meaning to reread last year and never got around to it. This year it will happen. Edenbrooke is purely for pleasure and The Happiness Project is to review all of the things I learned the first time and hopefully implement a few more of them. In terms of quantity, this is my most ambitious list of goals so far. I'll need to read 21 books in order to complete these goals (last year, it was only 14). However, many of them can be completed with fairly quick reads, so I'm hoping it's doable (but still challenging). If you want to see some really ambitious goals, check out my friend Carrie's list. 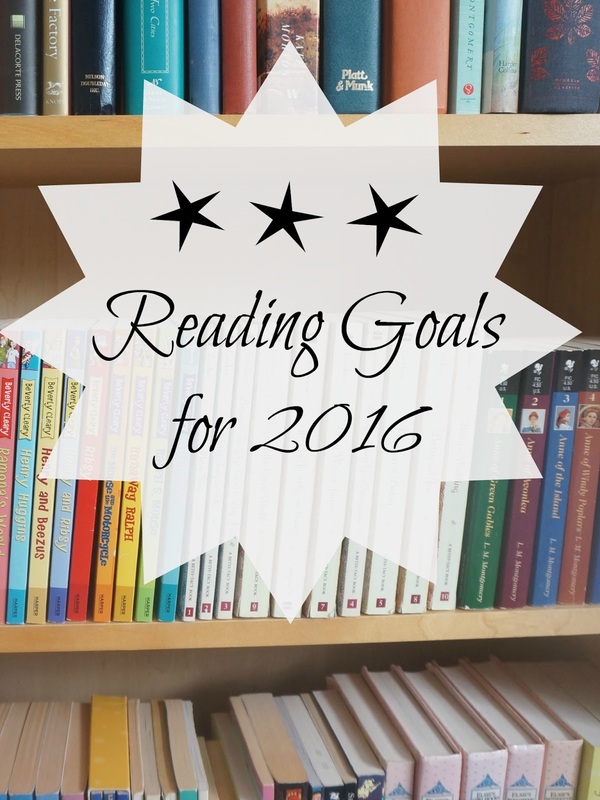 What reading goals do you have for 2016? I loved reading this!! I started following your blog after I found your 2015 goals from last year! Can't believe a year has gone by. I haven't made my reading goals yet, so glad I have yours to inspire me. So nice to meet you! I LOVE hearing from readers, and I'm so glad you took the time to write not just one comment but two! I would love to hear what reading goals you end up making, and I look forward to interacting with you more through this space! I look forward to your yearly goals like a kid at Christmas! We have so much in common here! I enjoy listening to classics, too, and I'm forcing myself to READ Jane Eyre this year. I might let myself listen to Emma, but I'd like to read that, too. I need to work on savoring instead of checking things off the list. I love your Olympic goal. May I suggest Andre Agassi's "Open"? He won the gold medal and also a Grand Slam. I know nothing about tennis and don't care much for sports in general, but this was a superb memoir, very honest about the good and bad. His integrity really impressed me. Also, "Boys in the Boat" is out in a YA version. Might be a good read-along with Aaron, though I'm unsure of the reading level. Yay poetry! I can't wait to see what you'll choose. I just re-read The Happiness Project (great minds think alike...). Like you, I adore it. It was esp. good reading it at this time of year, when one is in the mood to make changes. Lastly, thanks for linking up to my goals. What a nice surprise. Oh Jane Eyre! Carrie, you're in for a treat! Yes, I'm hoping to get to The Happiness Project before we get too far past the newness of 2016. Goal 2: Eva Ibbotson is amazing! 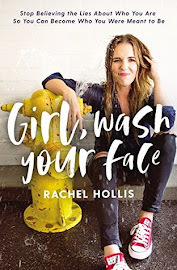 Her adult books are mostly delightful romances, and her kids books are mostly bouncy fantasy with the occasional introspective yet actiony YA. It's hard to go wrong, but my family has lots of recommendations, whether you want a read aloud, a book to share with Aaron, or something to read by yourself. Edith Wharton has written powerful books which I was glad to read, but Ibbotson has major shelf space in my house. Goal 7: I have a fondness for Under the Lilacs, if you want to branch out a bit. Or you could go crazy and get some of the re-discovered gothics by Alcott; I haven't read them so I can't promise you'd like them. Goal 3: One of these three is not like the other... I found Stegner a bit of a plod, but I may have just been feeling very shallow when I read Angle of Repose with a book club. I've liked Doig (he's good for filling in states on my 50 States challenge), and I can't imagine a life without Wodehouse. I feel that last is the biggest hole in your cultural education, if that is the point of this goal. Also, if you put this one off until the end, Wodehouse definitely has the shortest books. Yay! I'm glad to hear from an Ibbotson fan--makes me think I'm on the right track! Under the Lilacs...I've never even heard of that one! Well, that's what these goals are for--to fill up the holes in my cultural education, so it sounds like I definitely need to prioritize Wodehouse. Where should I start with him? You clearly forgot a new "bookclub for two" book. ;) I would love to do another classic with you, I'm happy to piggyback on to whatever you choose for #4. So inspiring you are (Star Wars dig just for you!)! How could I forget that?! You've got yourself a deal! You up for Sense and Sensibility? Let me just tell you what Louisa May Alcott book NOT to read: it's called "A Long Fatal Love Chase" and it is as ridiculous as it sounds. I picked it up at my old library in Littleton. They did an annual book sale when you could but a bag of books--however many you could fit in a grocery sack--for $3. So I grabbed this book. The cover said something about it being a recently discovered gem of the celebrated Miss Alcott. Well, after years of seeing it on my shelf, I finally picked it up and skimmed it, and you know what it reminded me of? Jo's hideously melodramatic short stories in Little Women :). It did make me realize that Little Women is truly autobiographical! Louisa's writing improved just like Jo's. Ha! These kinds of recommendations are necessary as well. Thanks for the heads up! Love this, Amy! It's a really liberal list. I love books with lists of books, don't all great readers? I recommend Alice Ozma's "The Reading Promise," which I found when looking in the library for "The End of your Life Book Club." Serendipity! You will love to read how Alice got her name! My latest find is by a book reviewer called Bethanne Patrick. She is the editor of a title (are you ready for this long title?) "The Books that Changed My Life: Reflections by 100 Authors, Actors, Musicians, and Other Remarkable People."!! You will all be amazed by the choices which cover all genre, including children's books. Enjoy these great lists!